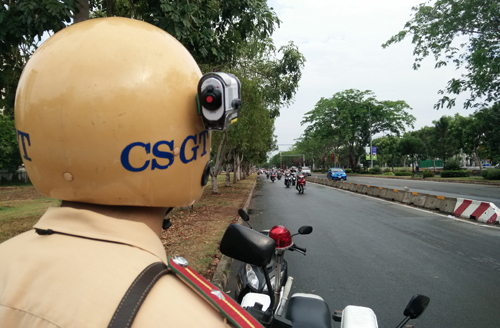 HCM CITY (VNS) — The traffic police in District 7 of HCM City were recently equipped with helmet cameras that, they said, would help them catch traffic violators with clear proof. Pham Hong Nam, an officer with the Traffic Police team of District 7, said the idea of installing cameras onto helmets was proposed a while ago. "Several violators just don't co-operate with us. They don't admit they have done wrong and insist on proof of their violations," Nam said. He said the cameras were very helpful, according to initial reports. "The cameras can record images from far away. During our shifts, we don't need to argue with the violators, but just have to show them the images," Nam said. The cameras can also be a tool to help prevent wrongdoings by traffic officers, he said. "If an officer stopped a passenger and, at the end of the day, there was no relevant ticket, then we would know there was something wrong with that case," Nam said.